Often, when a bunch of us meetup to eat, we do the standard Japanese or Chinese thing and to a lesser extent, near-fine dining. However, to change it up a bit, Bear suggested we go grab some Filipino cuisine. Well... that's easier said than done because the options are few in the GVRD. As I've said before, there are only a handful of Filipino restaurants and compared to the actual population, it is truly disproportionate. And as same as always, my Filipino friends remark that they merely just cook the food at home with often better results. Well, since our group did not have any Filipino representation, the only way we could get it that night was Pinpin out on Fraser. 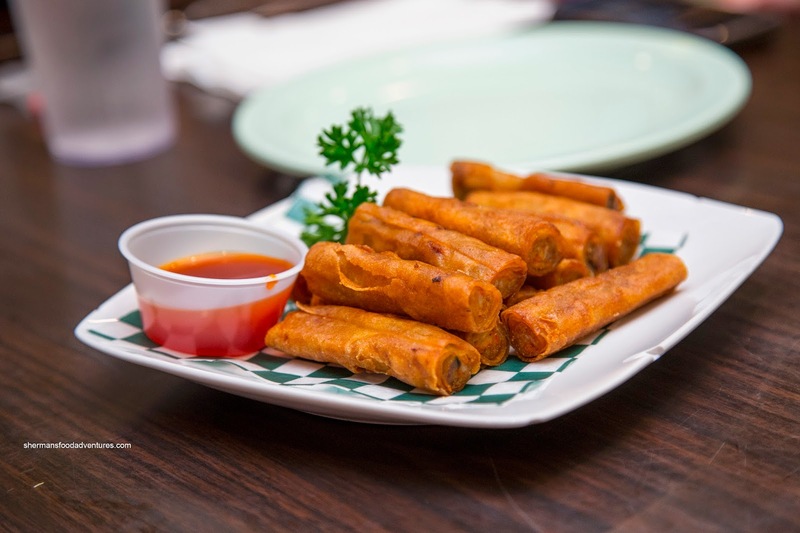 To start off with a little bite, we got literal by ordering the Lumpia Shanghai (finger-size spring roll). These were hot and crispy with a balanced mix of pork and veggies. Although most of the pork was moist, there were a few pieces of bone and fat that were not that appealing. Next we had the 1/2 Fried Chicken. From its appearance, the skin looked to be quite crispy and in fact it was. However, the meat was pretty dry and not seasoned very much. Although not my personal favourite either, I like the one from Max's more since it is less dry and more flavourful. 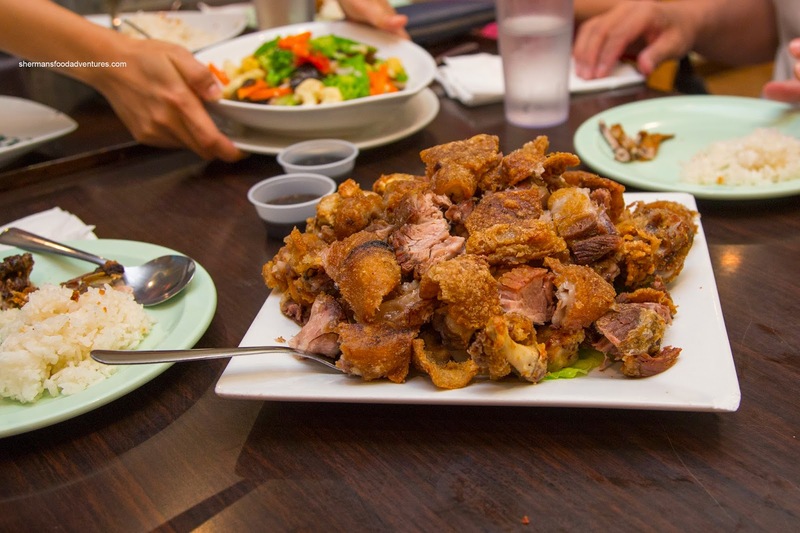 We decided on ordering the large Crispy Pata, but when it arrived, our server proclaimed it was an extra large portion (for $1.00 more). I guess they were out of large pork hocks? 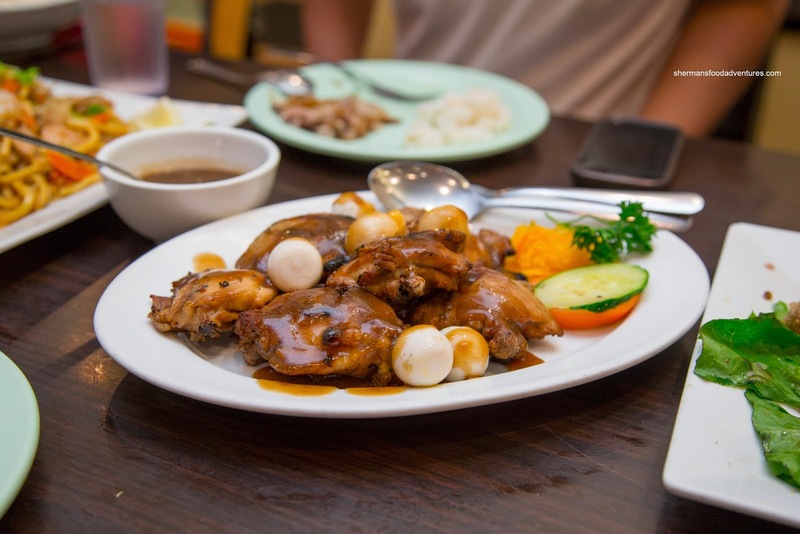 Whatever the case, we enjoyed it as the meat was succulent and tender while well-seasoned. Of course the vinegary soy helped cut the heaviness and salt. As for the pork skin, it was fried up until super crunchy with the fat rendered. To even things out, we were got the Mixed Veggies. 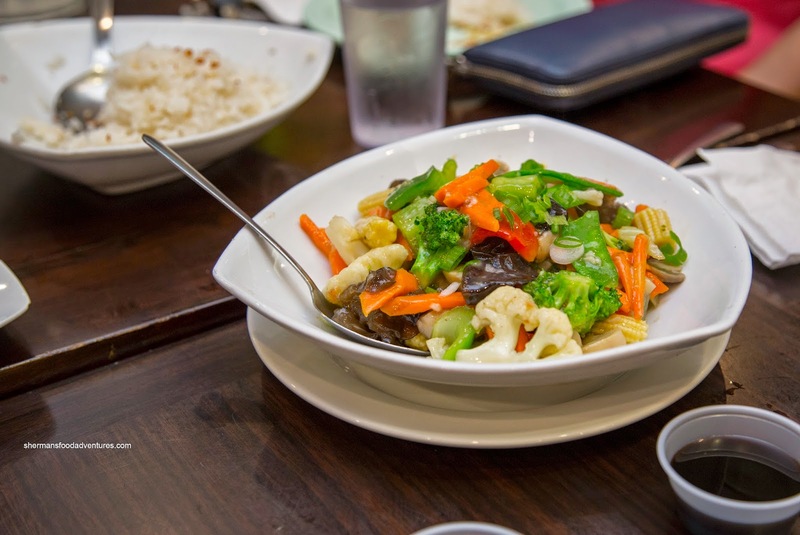 This stir-fry was nicely prepared where the veggies were vibrant in colour and firm to the bite. A subtle layer of starch-thickened sauce added a mild flavour to the veggies. 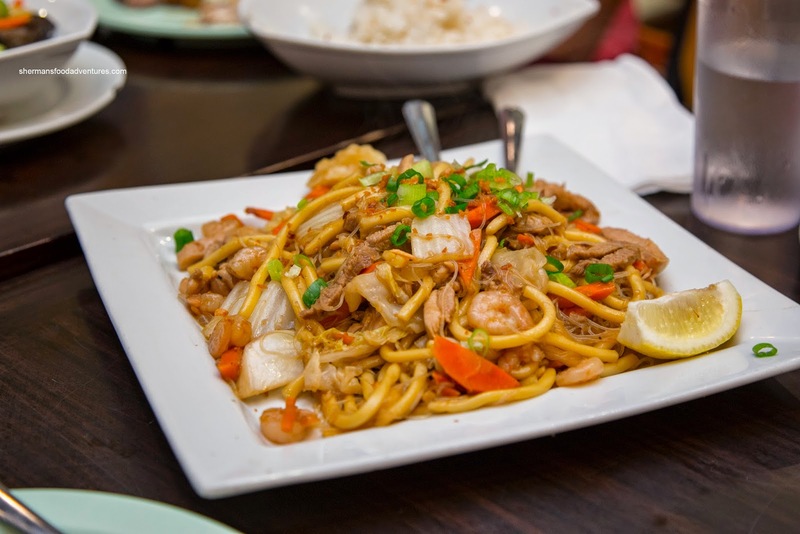 We couldn't decide which noodle dish to have, so we ordered both starting with the Pancit Miki Bihon. Although the vermicelli was a bit too soft for my liking, the whole plate was the beneficiary of good wok heat where the flavours caramelized and the moisture evaporated (and soaked up by the noodles). Adding more aroma was the plethora of garlic. As for the ingredients, the shrimp had a good snap while the veggies were still crisp. 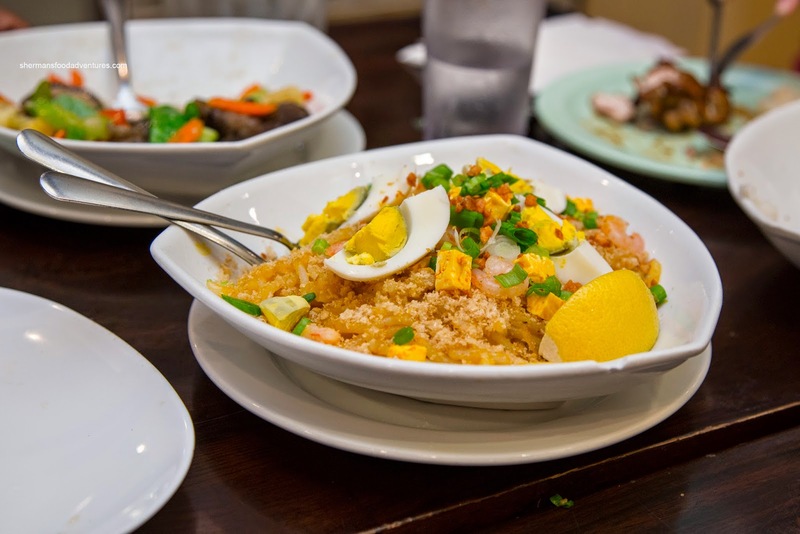 Our other noodle dish was the Pancit Palabok. It was pretty saucy (as usual) and soft as well. It had the trademark seafoodiness as well as a light pepperiness and sweetness. Of course we couldn't get out of their without getting the Chicken Adobo. 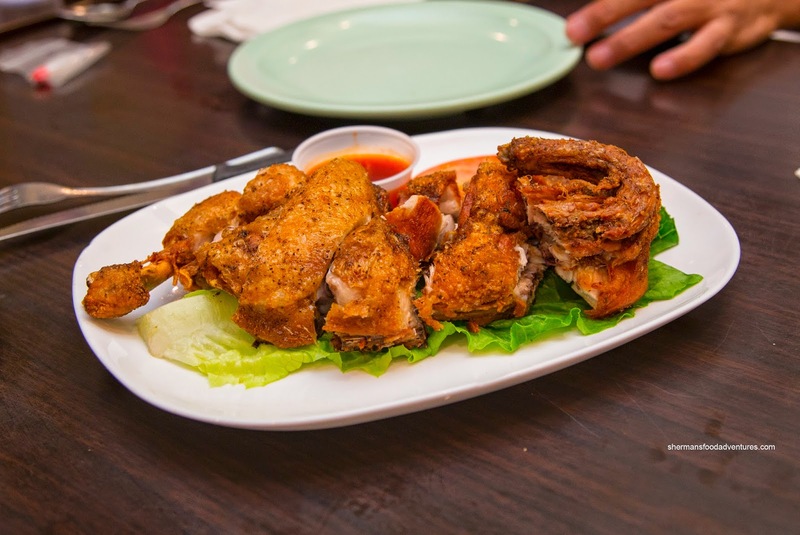 This featured chicken thighs charred and topped with a thickened adobo sauce. For me, I felt it wasn't very impactful. I like my adobo on the vinegary side and this one was far too mild. Also, I wasn't too sure about the viscosity of the sauce, I much prefer a non-thickened version. The chicken was okay though being sufficiently tender with well-rendered skin. We were pretty stuffed, so we were on the fence about dessert. 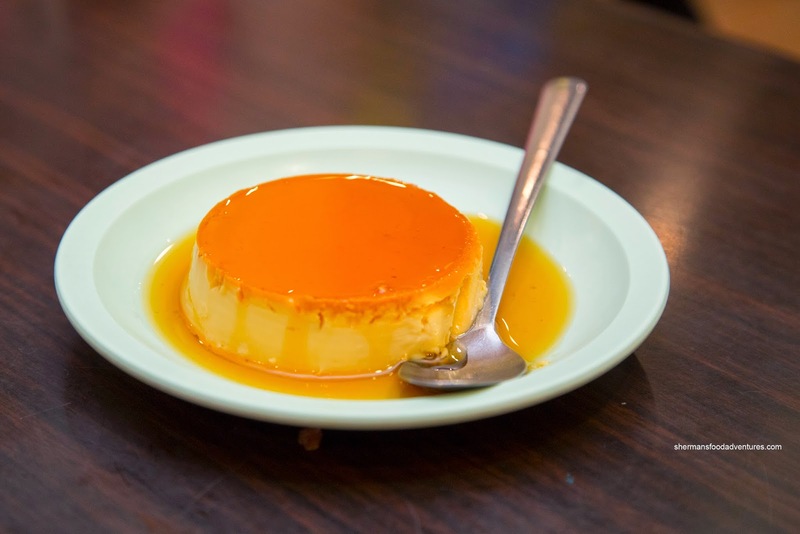 With Bear around, he literally tipped the scales and we ended up with 2 desserts including the Leche Flan. This was silky and thick where the carmelized flavours were smoky and sweet. Luckily we shared this as it was pretty rich. We were inspired by the table beside us and their Grand Halo-Halo, so we ended up with a much smaller version with ube ice cream. Not shown in the picture were all the usual ingredients hidden underneath the ice. 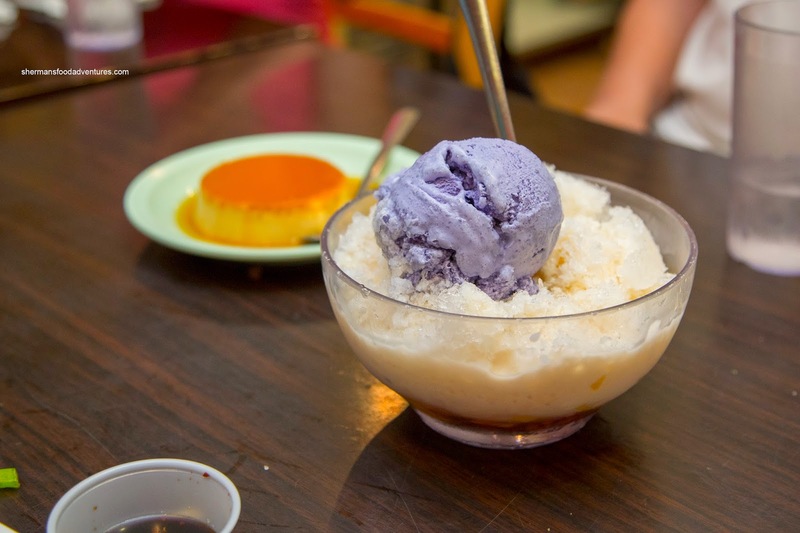 The combination of beans and palm fruit added texture in a chewy manner which was contrasted by the smooth ube and ice. This was a sweet end to a filling meal (we didn't even come close to finishing everything). 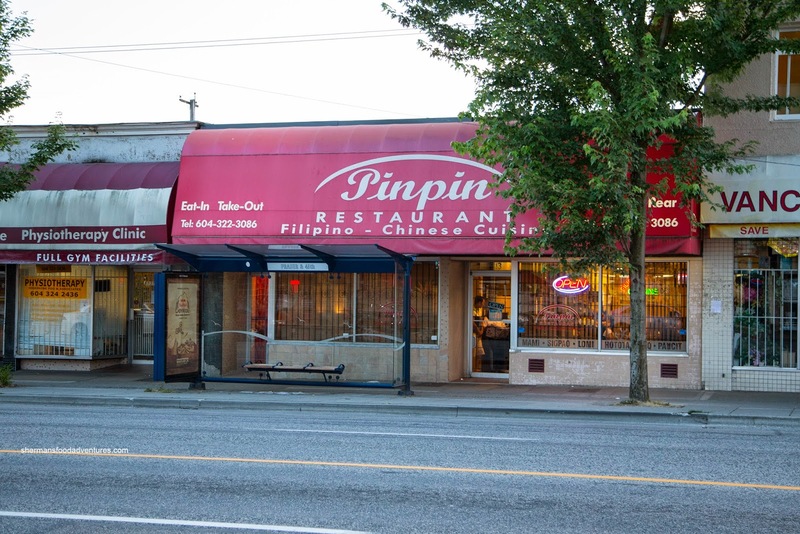 Sure, some things could've been better and overall, Filipino food can be heavy, but considering the lack of options in Vancouver, Pinpin does the trick. That's exactly what I ask my filipino friends..... and they also say that they make better food at home for way less.....then they invite me over for dinner! My Filipino coworkers recommended Pinpin for their sisig (both kinds) and it was the best of the dishes that we tried there.